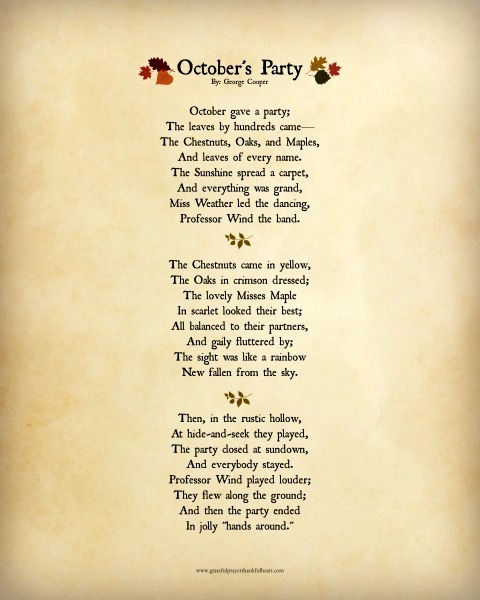 What do you love best about October? The brisk mornings? The colorful foliage? How about the flavors of the season? We love all of these things and picked the month of October for our wedding day. Soon John and I will be celebrating another anniversary. Coffee and delicious Pumpkin Scones is how we like to start the day. For many years, celebrating anniversaries didn’t always happen. 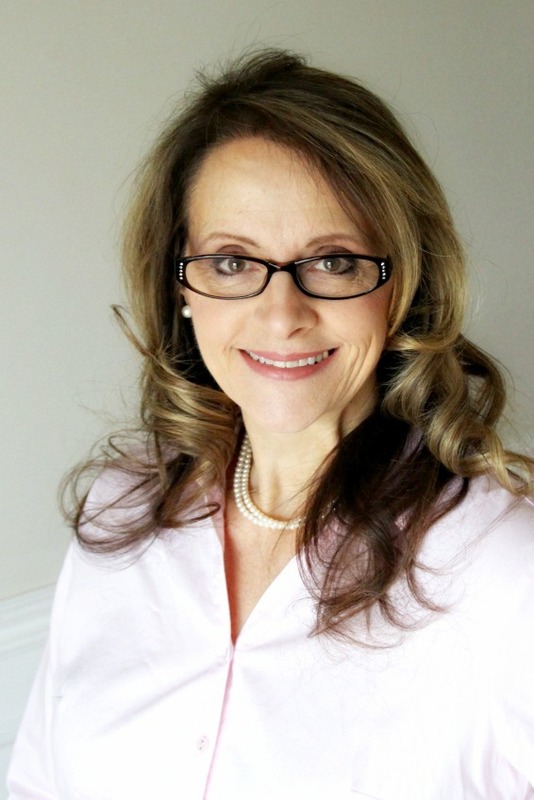 The business of raising children and the extra funds weren’t always available. A card and small gift and an occasional dinner out was enough to mark the occasion of that special day. Several years ago, we decided we would set aside three special dates and celebrate is an intentional way. Our birthdays and our anniversary. We take the day off and spend it together. Some years we go away overnight or for the weekend. Most times we just spend the day together going somewhere local. We live a short drive from Philadelphia and frequently take the train in a stroll about. It is often the little things that set the day apart. 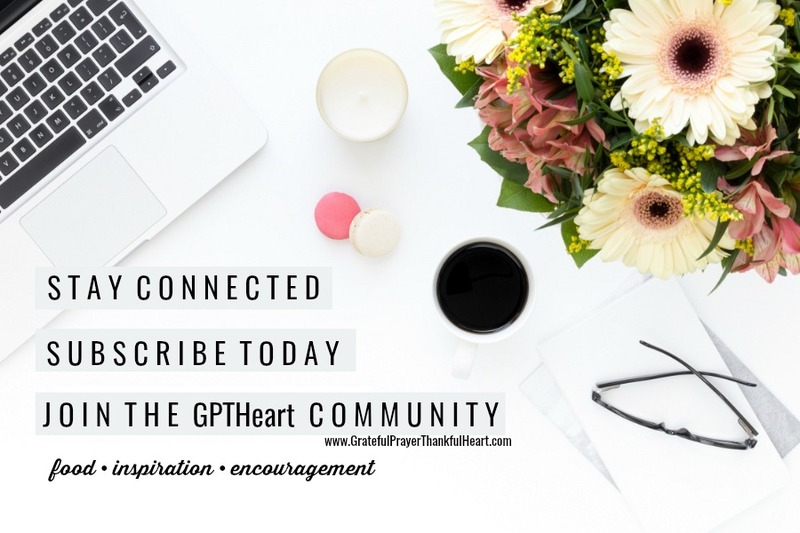 Putting aside the everyday demands and thinking of each other is a great way to connect and enjoy each other. We wish we had begun this tradition earlier in our marriage. We get an early start, making sure we get the most out of every moment. It may seem like a small gesture, but sharing a breakfast together sets the tone. Sure we could head out to a restaurant to eat breakfast, but is we plan to eat out, we prefer waiting for a later meal. Pumpkin, pumpkin everywhere! Pumpkin surely is a popular flavor this time of year. 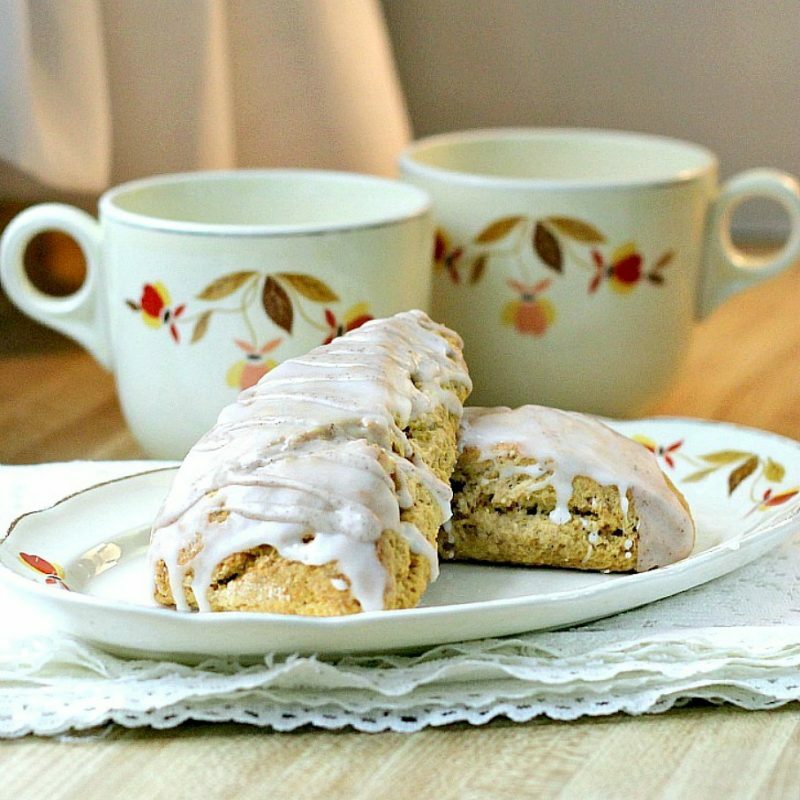 These pumpkin scones showcase pumpkin and are a great breakfast or snack treat. Double glazed with just the right amount of cinnamon, nutmeg, cloves and ginger, they are great with coffee, tea or a glass of milk. Bake them the day before of the week before because they freeze well and can be reheated quickly. They will be ready to serve before the coffee is brewed. Because I love October and because I love my readers, I made a free printable for you when you subscribe! Download your FREE printable now! This copy-cat recipe is supposed to taste like the Starbucks version. I have never had a Starbucks scone so I can’t really compare but I do know these are very tasty! Preheat oven to 425 degrees F. Line a baking sheet with silicone mat or with parchment paper. Combine flour, sugar, baking powder, salt, and spices in a large bowl. Using a pastry cutter, or food processor, cut butter into the dry ingredients until mixture is crumbly and no chunks of butter are obvious. Set aside. In a separate bowl, whisk together pumpkin, half and half, and egg. Fold wet ingredients into dry ingredients. Form the dough into a ball. Pat out dough onto a lightly floured surface and form it into a 1-inch thick rectangle (about 9 inches long and 3 inches wide). Use a pastry scraper or large knife to slice the dough twice through the width, making three equal portions. Cut those three slices diagonally so that you have 6 triangular slices of dough. Bake for 14 to 16 minutes. Scones should begin to turn light brown. Place on wire rack to cool. Mix the powdered sugar and 2 tbsp milk together until smooth. When scones are cool, use a brush or knife to spread the sugar glaze over the top of each scone. As sugar glaze firms, make the spiced glaze. Combine the ingredient for the spiced glaze together. With a spoon or whisk, drizzle this thicker icing over each of the pumpkin scones and allow the icing to dry before serving (at least 1 hour). So, this is what we celebrate. A life-long journey. Together. Through the good times and the not so good times. 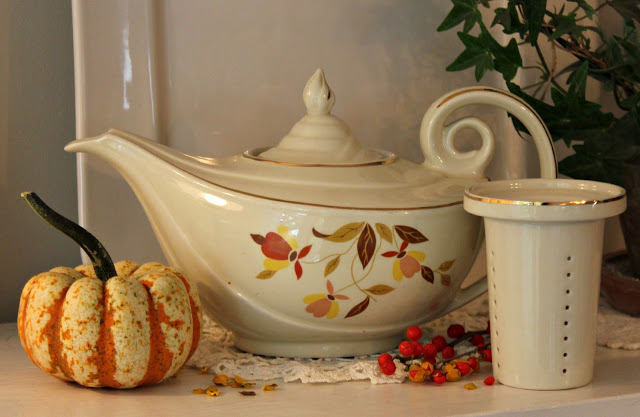 Do you recognize the vintage pottery in this post? You might like to see additional pieces. Click Hall Autumn Leaf Pottery to read more. Happy anniversary to you two! Celebrating special days is something my sweetheart have done through the years. Like you, there were years when we couldn’t go away for the celebration but we’ve almost stopped and made those days special. I loved seeing your wedding photos. We were married three years before you and remember the days of polyester, ruffles and sideburns very well! First off, Happy Anniversary, Lorraine. I think you have gotten even more beautiful over the years!!! And Mr. Handsome, too! That scone recipe sounds wonderful. I love scones. I mentioned them to someone the other day and she said. Oh- I can’t STAND scones. (Seriously?-Can you believe it)…lol Not sure we can be friends anymore. Happy Anniversary. The recent pictures you’ve posted of you and John together you look as happy as the day you married. I love seeing couples who stick it out through thick and thin. 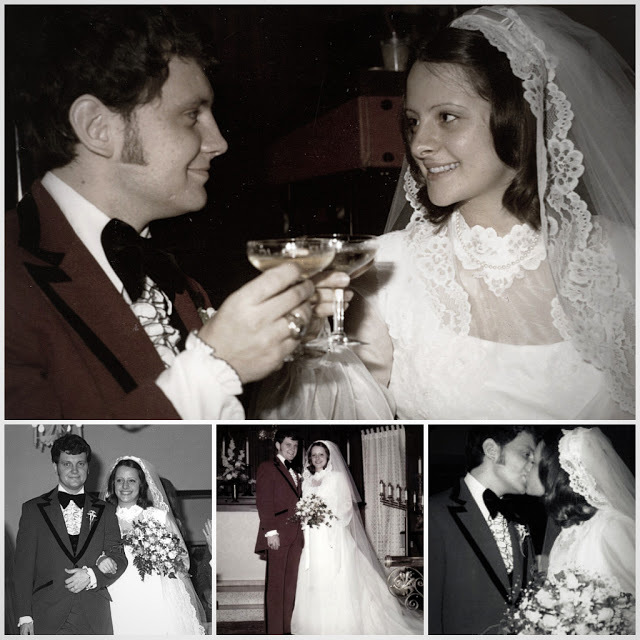 Happy Anniversary Lorraine and John! October is my favorite month and a perfect time of year for a wedding. I live scones and just about anything pumpkin! And the autumn leaf dishes, sighing! I found one tea cup and saucer in the pattern a while ago. I believe it was on EBay. I'm just getting around to a few blogs this evening so wanted to say Happy Belated Anniversary wishes to you and John …. may the Lord give you many more wonderful years together! Happy Anniversary! Sounds like a lovely day! The pumpkin scones look delicious. Those scones look delicious, I've been going crazy for pumpkin lately! Can't wait to try out your pumpkin scones. Happy Anniversay Lorraine! Sounds like you had a fun day. My husband and I will celebrate 32 years on Oct. 27th. How time flies when you're having fun! You were married the same year as we were and we had very similar views. What a good picture! Wishing you two a very special day together and many more years enjoying each other. Thank you for sharing that good looking scone recipe. I have pumpkin on hand right now. Congrats on reaching this milestone! Happy 36th! Wishing you MANY more. Re: American Girl outfits, have you tried etsy.com? Congratulations!! Sounds like you had an absolutely perfect day together! Thanks for the recipe — I'm have a Victorian Autumn Tea in a few weeks and think I'll use your recipe! I had to smile too because of the cups and dish . . . years and years ago I toted about 10 pieces of that around from move to move. My mother-in-law picked them up at a garage sale. I never, ever used them and finally, on one of our many moves . . . gulp . . . I just left them in the apartment for someone else. I kick myself everytime I see them in an antique shop! Live and learn! Sounds like you had a splendid day! Thanks for sharing breakfast with us…this sound so yummy! Just wished you Happy Anniversary on Facebook but had to come here and do the same! I love all the pictures. You are so beautiful now and then! Sounds like the perfect type of day! The scones look really good as I love anything pumpkin! Thanks for your comment on my question today. Please don't go private!!! I know you receive a lot of comments so I can understand it being difficult at times to get back to everyone. I was trying to find out if someone new comes to your blog, do you pay them a visit and say hi? I received so much feedback, makes me feel good! Enjoy your night! Happy & Blessed Anniversary!! Sounds like a perfect day :o) I love your wedding photos too!!! & thank you for sharing the scones recipe…yum! Can't wait to make these. I love scones. Happy Anniversary to you both!! I have made those copycat scones & they are delicious! I posted about them on my blog, too! Happy Anniversary to you and John. It sounds like you had a lovely day. I almost got tears reading this. It said that there needs to be no showy anniversary celebration, just the comfort and joy of being together … it sounds like a wonderful day! The scones look so good and I will try them … just as I made your pumpkin bars (or cake) on Sunday when the kids came for dinner. It was a great success and is stretching for our lunch guests tomorrow! Happy Anniversary! Congratulations, Lorraine- We had 36 years on Aug.17th…who knew we would all make it this far? You were a pretty bride but I think you are even prettier now. You are just a gorgeous lady. You two looked so cute back then, but you don't look so bad now either. And those pumpkin scones………oooooh, that sounds YUMMY! Sounds like a delightful way to celebrate the day. Those scones sound delicious, especially with coffee! Your wedding photos are so pretty. celebrate in His love and care!! looking scones. Thanks for sharing. May you be blessed with many more happy years together! Those scones look yummy. I will admit I have never eaten a scone before. We are also not coffee drinkers…so with that said what would you eat them with…are they like a bisquit? I do want to try this recipe. We love all thinks pumpkin. ooops… one more thought… do you have a wedding PIC you can show?? ?